Amazingly, Brett Favre isn’t the biggest newsmaker in Minnesota right now. Earlier this week, WR Sidney Rice announced he had hip surgery, which will cost him about half the season and could still land him on injured reserve. In response to Rice’s injury, the Vikings signed Javon Walker and traded for Greg Camarillo. Below are some thoughts on Rice’s injury and the acquisition of Camarillo (we already wrote about Walker here), both from an on-field perspective and a fantasy football perspective. Rice had a breakout season last year with Favre throwing the ball, catching 83 passes for 1,312 yards and eight touchdowns. While Favre’s arrival certainly aided Rice’s development into a Pro Bowl selection, it was also the common third-year emergence for receivers like Rice who were high draft picks. (Rice was a second-rounder.) He’s big and has outstanding ball skills, which makes him a downfield threat despite marginal NFL speed. Rice’s size coupled with Percy Harvin’s breakaway ability would have given the Vikings a top-level receiving duo that’s also young, but now that Rice will miss much of the season, the Vikings don’t have a No. 1 receiver. Maybe Harvin can emerge, or maybe former high-dollar free-agent signing Bernard Berrian can recapture his promise. But neither Harvin nor Berrian has the size to be such a dependable threat as Rice. After injuries benched Rice for half the season and put Harvin’s season in question, the Vikings dealt for reinforcements. Camarillo, a former undrafted free agent, established himself as a solid receiving threat with 110 catches over his last two full seasons. While he has only averaged about 11 yards per catch during those two seasons, he’s a dependable possession receiver who provides depth for the Vikings and who may eventually fit into the slot if Rice and Harvin return. 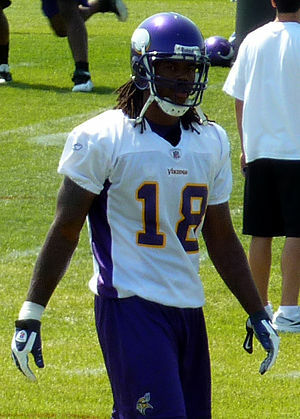 If nothing else, Camarillo’s acquisition ensures that the Vikings will still be able to run multi-WR sets effectively. In exchange for Camarillo, the Vikings sent Sapp to Miami. Sapp started a career-high seven games last year, and he’s proven to be a decent nickelback and special-teams player. Since Camarillo was likely losing prominence in Miami after the addition of Brandon Marshall and the development of Patrick Turner and Brian Hartline, it makes sense for Miami to get a solid role player in return for him. For fantasy football purposes, Rice’s injury knocks him out of being a top-15 fantasy wideout and makes him a speculative pick who’s worth a roster spot in leagues with deep benches. He’s probably now worth a pick around No. 40 among wideouts. Harvin is a top-20 talent whose migraine problems make him a high risk/high reward pick, and Rice’s injury raises Harvin’s upside a bit. Berrian’s stock shoots up so that he is now draftable as a starter, while Camarillo is worth adding to draft boards among the top 200 overall. Most of all, these injury problems in his receiving corps limit Favre’s upside and knock him out of Tier 2 and onto the same level as risk/reward picks Jay Cutler, Eli Manning, and Kevin Kolb. At this point, expecting Favre to even approach his 33-TD season of a year ago is foolhardy.